You turned 6 a few days ago. 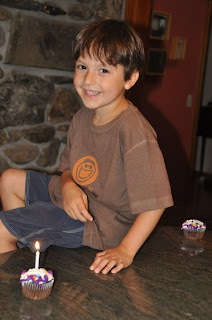 It was a low-key birthday -- cupcakes at school, presents, pizza, and Beatles Rock Band -- and you seemed very happy. So I'm glad we didn't plan for more. You are a funny little 6 year old. I'm pretty sure you don't think you're 6; rather, you were born 9 in your mind. Like Will. You've never seemed like a little boy. Physically, you've always had great balance and coordination. Mentally, your amazing memory is your gift, to be sure. Emotionally, you're as steady and predictable as a train schedule. And when you walk into a room, people smile. Probably because of the rascally look in your raven-black eyes. That all said, you have your quirks. You make paper underwear. You won't wear shirts with buttons or zippers. No interest in group activities such as soccer or Cub Scouts (though you did give in to t-ball this past spring--because Will plays baseball, I'm sure). You have little interest in friends or playdates beyond those of your brother. No dirty hands or maple syrup drips on your shirts from your morning pancakes or waffles. Like your sister, you seem to prefer order to chaos, and I don't think we'll have struggles with you over homework, as you're completely on task with all things related to school. So far. You don't strike me as a typical absent-minded, off-in-another-world adolescent boy. Games, games, games are your world. I'm not sure we've done right by you as parents by allowing you so much access to video games. But you're #3 -- you've been granted the Many Freedoms of Birth Order -- and the World of Kids is a new place these days, so it all is what it is. I have visions of your college days including lots of late nights in some online gaming world or playing poker. When you're without your siblings, you're rather quiet, easy going, hardly noticed. You also play shy in social situations, but you are no wallflower. In any family discussion, your voice is heard -- loudly and clearly. In school, your teachers also tell me your voice is heard -- more often than they would prefer, actually. (You also say "actually" a lot.) When you called the class bully a "turd" last year in Kindergarten, we knew you'll have no problem holding your own in any social structure or conflict. I just hope that hutzpa doesn't get you in too much trouble. My hopes for your next year are that you can establish a solid first-grade groove at school, enjoying learning and succeeding at new responsibilities like homework. I hope you can establish some good friendships that are all yours (e.g. not Will's). I hope you don't provoke bullies. I hope you still reach out to hold my hand when we're walking out to the garden together. Of course, staying healthy is always at the top of the wish list. And I hope you hold strong to your "Party of One" happiness and stride. It's a perfect way to tackle being 6. Lovely. You should read this at his wedding. And cry, of course. Wow! That really was beautiful! You really do know your kid!!!!! I look forward to getting to know him better. This blog has really given me a great start. What a nice tribute to Max from his loving Mom. I love this letter -- your insight speaks volumes about what a wonderful person you are. I'd love to have coffee with you sometime, and chat about gardening, our lives and children (your children sound uncanningly similar in personality to mine!) -- but alas, you live at the other end of the country!